Aloe glauca Mill. var. elatior Salm-Dyck, Aloe glauca Mill. var. humilior Salm-Dyck, Aloe glauca Mill. var. major Haw., Aloe glauca Mill. var. minor Haw., Aloe glauca Mill. var. muricata (Schult.) Baker, Aloe glauca Mill. var. spinosior Haw., Aloe muricata Schult., Aloe perfoliata L. var. glauca (Mill.) Aiton, Aloe perfoliata L. var. kappa L., Aloe rhodacantha DC. Widespread (EOO ± 95 000 km²) and not threatened. Occurs in scattered, isolated areas in the Western and Northern Cape, from between Caledon and Swellendam eastwards to Laingsburg and northwards to Steinkopf. Highly variable, including renosterveld, nama karoo and succulent karoo vegetation. Appears to prefer arid rocky hills and mountain slopes. A. glauca is not threatened in its natural habitat (Van Wyk and Smith 1996). 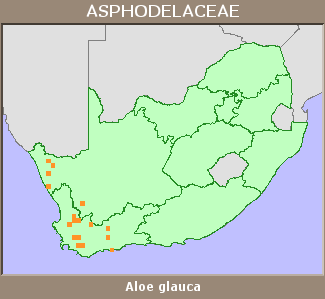 Due to the highly varying habitats and isolated occurrences of this species, four different variants were previously recognized (Reynolds 1969), the typical form from the Caledon-Swellendam area, the Karoo form from Laingsburg, Matjiesfontein and Sutherland, the Piketberg form and the Namaqualand form from Steinkopf and Springbok. These forms differed mainly in their leaf characters, which is quite likely the result of the local environment, but there is no difference in the floral structure. Therefore, these varieties are no longer recognized (Glen and Hardy 2000).